14-15. And when they were come to the multitude, there came to Him a certain man, kneeling down to Him, and saying, "Lord, have mercy on my son, for he is lunatic, and sore vexed; for ofttimes he falleth into the fire, and oft into the water. That this man is exceedingly faithless is clear from the words which Christ spoke in reply to him, "O faithless generation," and from the fact that the man himself blamed the disciples. The moon was not the cause, but rather, the demon would take note when the moon was full, and then would set upon his victim, so that men would blaspheme the created works of God as maleficent. You, then, O reader, understand that it is a foolish man that changes as the moon, as it is written [Sirach 27:11], at times waxing great in virtue, at other times waning and vanishing altogether. Then the foolish man becomes deranged and falls down into the fire of anger and lust, and into water, that is, the waves of the many cares of life, in which Leviathan the devil dwells, he who reigns over the waters. For are not the cares of the rich like waves that follow each other in quick succession? 16-18. 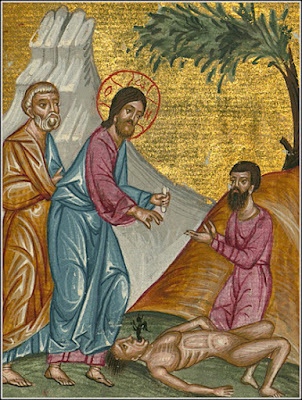 And I brought him to Thy disciples, and they could not cure him." Then Jesus answered and said, "O faithless and perverse generation, how long shall I be with you? How long shall I endure you? Bring him hither to Me." And Jesus rebuked him; and the demon departed out of him; and the child was cured from that very hour. Do you see how the man has shifted the blame for his own lack of faith upon the disciples, saying that they were too weak to heal? The Lord, therefore, shames him for accusing the disciples, saying, "O faithless generation," that is, "It is not so much the fault of the weakness of the disciples as it is of your lack of faith, which, being great, has prevailed over the equal measure of their strength." He rebukes not only this man, but everyone who lacks faith, even the bystanders. By saying, "How long shall I be with you?" Christ shows that He longs for the Passion upon the Cross and His departure from them. For He is saying, "How long shall I live among scoffers and unbelievers? And Jesus rebuked him." Whom? The man who was lunatic. From this it appears that he, too, lacked faith and his lack of faith had given occasion for the demon to enter him. 19-21. Then came the disciples to Jesus apart, and said, "Why could not we cast him out?" And Jesus said unto them, "Because of your unbelief, for verily I say unto you, if ye have faith as a grain of mustard seed, ye shall say unto this mountain, 'Remove hence to yonder place;' and it shall remove; and nothing shall be impossible unto you. But this kind goeth not out but by prayer and fasting." The apostles were afraid that they had lost the grace against demons that had been given to them; this is why they asked Jesus in private and with great anxiety. But the Lord reproves them for being imperfect in faith, saying, "Because of your unbelief. For if you had fervent, ardent faith, you would accomplish great things even though they appeared to be small." The location of the mountains which the Apostles moved is nowhere recorded, yet it is likely that they did move them, but the event was not written down; for not everything was written down. Or, by another interpretation, they did not move a mountain because there had been no occasion to do so, but they did even greater things than that. Note how the Lord said, "Ye shall say unto this mountain, Remove hence," in other words, the mountain shall move when you say the word. But the Apostles did not say the word as there was neither occasion nor necessity, and so they did not move mountains. But if indeed they had spoken, they would have moved. "This kind of demon is cast out by prayer and fasting." For they themselves who are demonized must fast, as well as those who would heal them; then comes the prayer, preceded by fasting, not drunkenness. Understand, then, that even perfect faith is as the grain of mustard seed, considered worthless on account of the foolishness of the preaching. Yet if it should find good soil, it grows into a tree in which the winged creatures of heaven, that is, soaring thoughts, may alight. Whoever, then, has perfect faith can say to this mountain, that is, to the demon, "Remove hence." For Christ was also referring to the demon that had gone out. 22-23. And while they abode in Galilee, Jesus said unto them, "The Son of Man shall be betrayed into the hands of men, and they shall kill Him, and the third day He shall be raised again." And they were exceeding sorrowful. He continually foretells the Passion, so that no one would think that He suffered unwillingly, and also, to train them not to be shaken by the unexpected when it occurred. To the sorrow He weds the joy that He will rise.